As a documentary wedding photographer I’m always thinking of how images fit together to tell the story of the day and for that reason my blog posts usually have around 50 to 80 images. However it is of course possible to tell a story in just one image. 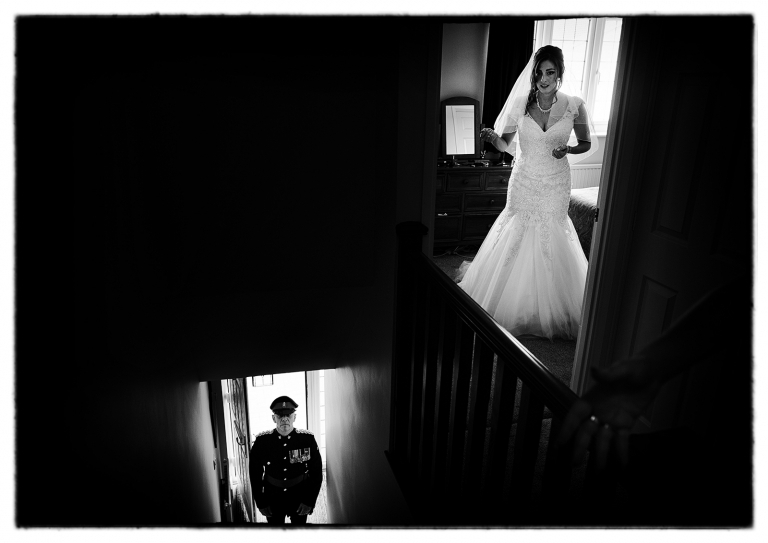 This is from a recent wedding in Northampton, Michelle had just finished getting ready and her dad waited at the bottom of the stairs. I could have captured these as two separate images but they wouldn’t have told the story of the moment, by waiting for Michelle to turn to her right and using a 24mm lens I was able to include two elements to the image. The open door behind her father adding to the story that they are about to leave the house for the church and start her journey in married life. Black and white removes all colour distractions from the image, making us feel in the moment. Technical details: Canon 6D, Canon 24mm 1.4L lens, 1/125th at F8.